After buying a new pillow we often lose sight of the fact that each pillow requires proper care. Even if you have chosen a pillow that suits you perfectly, inappropriate care can significantly reduce its lifespan. According to the manufacturers of the latex products, latex pillows can be used for 10-20 years but experts recommend changing it every 4-5 years. When you choosing a new pillow, you should be focused not on the previous model, but on your favorite position during sleep and condition of the spine, which can change over time. The cushion can accumulate dust, which we will inhale while sleeping. In addition, due to the fact that we sweat during sleep, it creates a beneficial environment for certain bacteria. Do you know that we spend one-third of our lives doing sleeping? Yes, it is true. Imagine a one-third of our life we inhale this dust and maybe even fungus spores from our pillows. And why you’re still not going to clean your pillows? Of course, maybe we exaggerate a little, but it really is exactly what happens. And if you really care about your health, you should periodically clean latex pillows. It does not take too much time, but the benefits of the clean latex pillow is just awesome. See also Best Pillow for Side Sleeper. Porous structure helps to air ventilation and evaporation of excess moisture, so the pillow keeps the required temperature and doesn’t absorbs sweat. Of course, the latex cushions are hypoallergenic and aren’t liable to the mildew formation, but they also require special care. In addition, a method of the washing latex pillows is somewhat different from method of the cleaning pillows with other fillers. And if you want maintained useful properties of your pillow and its original appearance as long as possible, you need to follow some simple rules. 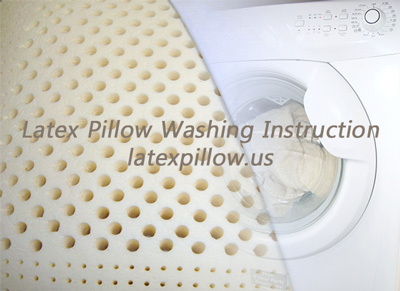 Is it possible to wash latex pillows in the washing machine? None of the manufacturers don’t recommend to do this! The manufacturers specify on the pillow package everything what you can and can not do with your latex pillow, so please read carefully these guidelines and restrictions. 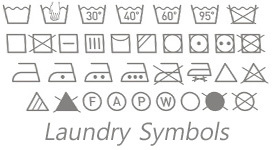 Read carefully all Care Symbols (Laundry Symbols) for your latex pillow. In any case, even if you have lost or thrown out your pillow packaging and want to know whether it is possible to wash latex pillow in the washing machine we definitely do not recommend doing this. Why? It is not worth doing for several reasons. It can tear during washing or spinning. It may compromise the integrity of pillows. The laundry detergent may not be fully clean up of pillows. It is very difficult to dry it out, which is not very good effect on latex pillow. So how to wash latex pillow? There are only a few simple steps that should be followed. Remove pillowcase. It can be washed manually or in the washing machine. You should change the pillowcase at least 1 time per week. Fill one container or silk with the warm water. Add a mild detergent, without active ingredients. Soak a clean towel in this liquid and then wring out to make it slightly damp. Wipe the cushion with this towel and pay particular attention to spots if any. Then wrap the cushion with a clean dry towel and gently squeeze any excess moisture. Put the pillow in a well-ventilated area(without direct exposure to sunlight) to dry completely. After drying, cover your pillow with a clean ironed pillowcase. Now you know how to clean latex pillow! Follow these few easy steps and your pillow will be always like new one. Note that latex pillow begins to break down from exposure to direct sunlight. Therefore, never leave a latex cushion under direct sunlight. If you have spilled coffee or tea on the latex pillow then primarily take a dry towel, wrap the cushion with it, and gently squeeze any excess moisture. And then repeat the above steps for the complete cleaning pillow. If you constantly monitor the cleanliness of your pillows you will not only extend its life but also thereby ensuring a healthy sleep for themselves.